Happy 11/11 my fellow See’rs! We’re on the brink of extraordinary change. It’s been a tumultuous and thrilling energetic transition these past few months. Can you feel the shift in frequency? We’re being upgraded to a higher level of awareness. Many people are experiencing faster synchronicity, emotional volatility and disturbed sleep, as the Universe urges us to shed our fear of truth and embrace our natural superpowers. 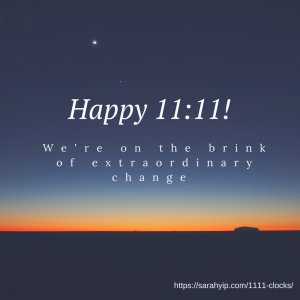 In celebration of this day of peace, here are 22 symbolic insights into 11:11, and affirmations you can use to accelerate your compassion. I urge you to read this list out loud, and meditate on any affirmations that stick in your throat/ mind/ heartspace*. Even better, write more of your own and share them with others! 12) I am a Leader leading Leaders. I am a Teacher teaching Teachers. I am a Healer healing Healers. 15) Won. Won. Won. Won. Just Turning Up is Success. I have Already Won. I am Already One. (As Steve Jobs, a wise Lifepath 1 said in his talk to Stanford graduates, “Remembering that I’ll be dead soon is the most important tool I’ve ever encountered to help me make the big choices in life. 18) I’m Creating a Forest to Protect my Creations. I Deserve Support and Attract my Soulmates Now. I hope you find this list and gift from me useful on your journey. Remember, many steps create a staircase and many Souls living on their purpose create a new humanity. Find your lifepath, embody your perfection, revel in your Soulmate and Twin Flame relationships, and start that dream career. As Deva Premal and Miten (also 11:11 See’rs) sing, There is No Goal But This. As I wrote in my 2017 Numerology Forecast, 2018 is a Universal Master 11 Year of Spiritual Growth, Double New Beginnings and Equal Partnerships. The next decade delivers huge openings for awakening people to bring their beliefs into the open. We will see waves of healers and 11:11 See’rs, who take a stand against misinformation. ‘As we raise our vibration, we will be tested’, so it’s vital to strengthen ourselves for the journey. It’s going to be huge. Don’t miss the portal for change. Trust that, as your leap, the net will appear. On 11.11.2011, my world exploded when my partner broke up with me and I spiralled into self-harm. Six years later I am happier than I could have hoped for in 1, 000 incarnations – I work in my field of genius as a psychic, have married my 11:11 Soulmate Kris, birthed two beautiful sons (including Charlie in August 2017) and reached millions of people through this blog. My life is proof that miracles come true and I wish happiness for you in every way too. Take care, sensitive friends. You are needed. You are loved. You are supported. 11:11 Means You’re on Track!